Ready to get to know us? Join us on Discord! Note: We are well aware that due to the changing nature of the game in its early access state that some of our vision may not make it to fruition. We ask that you be just as flexible as us! We hope to meet you along the way! Let our visions combine! 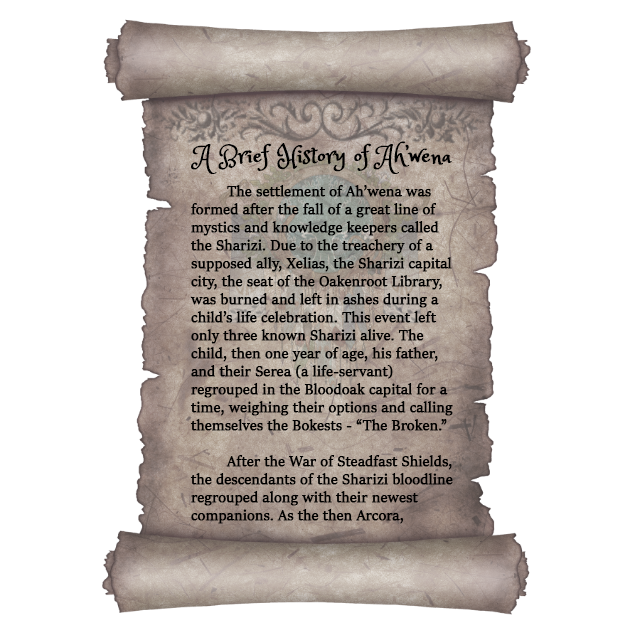 We have two Bloodlines, the Sharizi and Dreamwalkers each with their own distinct lore and backgrounds. While we are unsure about sharing surnames without marriage, we would love to have our families grow with many cousins and extended relatives as we find people who embrace our ideas! Regardless of “last names,” we hope to share some of the overarching culture we’ve created that can seamlessly slip into any tribe/biome with those who are interested. We are happy to discuss lore and history in Discord anytime! Hope to see you there! Healing & Culinary arts - Potion making, bandage making, medicines, alchemy, etc. (Whatever we're able to do with healing.) We also plan to provide only the best of foods to those passing through! Come one and all healers and chefs! Crops & Agriculture - If we can grow it, we would like to! We would like to have locally sourced ingredients for our herbal tinctures, wines, and fresh meals. Farmers will be one of the most important character types in our town! Armorers & Weaponsmiths - As a largely craft oriented town, Ah'wena would love to feature some master smiths, armorers, or other types of craft traders. Please feel free to contact us about setting up space for your trade! Artisan Crafts - Painting, writing, poetry, sculpture, flower arrangement... Pretty much anything artsy! If you are a crafter, you'll be pretty well welcome here. Bardic Arts - Similar to artisanal crafts, we need bards to entertain at our tavern, in our Night Court, and to teach at our university. Do you plan to play a singer, poet, painter, instrumentalist, dancer, acrobat or something else? We have a place for you here! Rest & Relaxation - We want to offer whatever sorts of rest opportunities we can offer to the denizens of Elyria, especially those residing in Sha'harizi County. This will include some sort of spa or medicine house, smoke house, Night Court, and inn (as the game allows). We will need roleplayers and PvEers to fill the roles of crafters and traders, servers, spa and medical attendants, and so on. This, of course, has a PvE element as well since we know it will be important for characters in CoE to rest and eat. Play out whatever life you want! We hope to bring many roleplayers through to socialize, play townspeople, crafters, traders, shadow warriors, and many more. Dreamwalkers - The Spiritalker tribe has been reborn as the Dreamwalkers, an elite force of survivalists and shadow warriors who know the land around Ah'wena inside and out. They participate in guerrilla warfare and stealth tactics to take out necessary targets. (RP lite/optional). Actively recruiting players interested in playing survival based combat ready characters who roam, hunt, live off the land and act as boundary wardens / scouts for the Town of Ah'wena. Aecir - The Aecir are Ah’wena’s guards. Caring, protective people, they respect the arts and pursuits of the Arcora and the people, but often do not pursue bardic avenues themselves. The Kal’Aecir is the Head Guard, personally watches over the mayor. Aecir frequently pursue other crafting careers aside from just being guards finding particular interest in armor and weaponsmithing. If a wild, free, and primal experience are something that piques your interest, then don't be a stranger. Come on down to Ah'wena in Discord and find out if the Dreamwalker tribe is right for you! 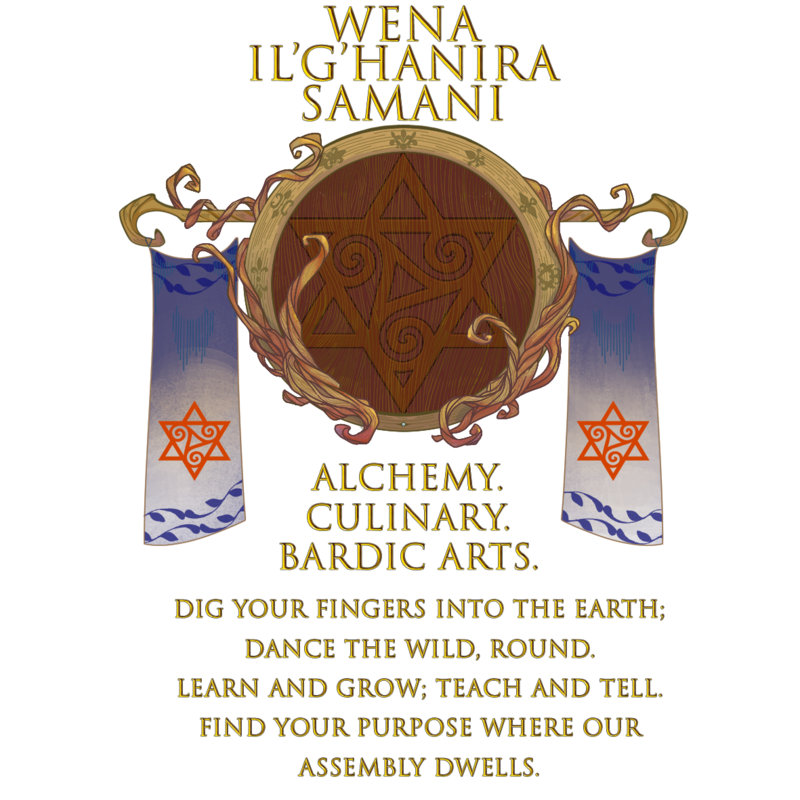 Of the many things Ah’wena citizens draw inspiration from, there are a core trio of focuses: bardic, culinary, and medicinal arts. 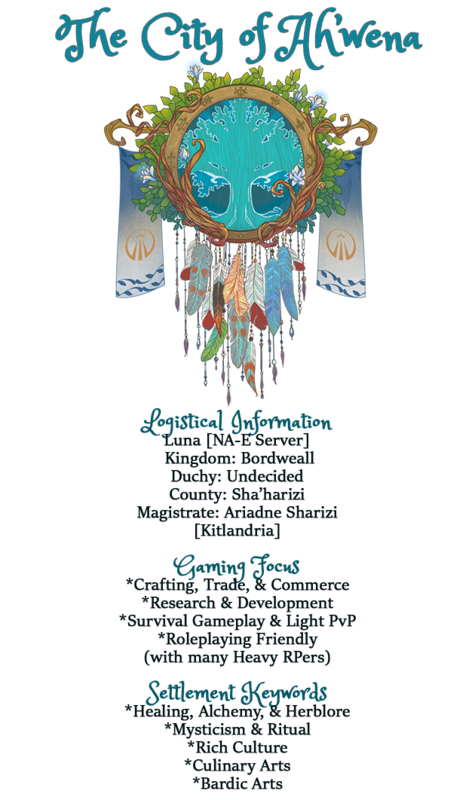 Those finding their homes in Ah’wena pride themselves in their fine food, intuitive healing arts, and visual, musical, and spiritual expressions of the divine bard within everyone. These elements are layered throughout the settlement. 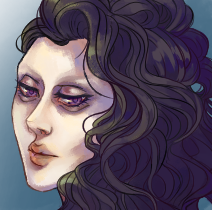 While any craft or trade might be found in the bustling marketplace, those that draw off the wild lands’ flora and fauna or the muse within each Child of Mann are most likely to be represented. For this reason, Ah’wena houses a school, Wena il’g’hanira Samani, where people can come from distant lands or neighboring settlements to study such arts with esteemed educators. What are the branches of the school & what can I learn? Wena il’G’hanira Samani means “Assembly of those who the world inspires” in the language of Tonasyn. We want people to be inspired by what the wild world around them has to offer - but beyond that, we want to titrate a sense of health and wellness down into a fine brew. As such, each branch of the school is an assembly of some sort that focuses on a specific set of skills and trades. For more information, check out the Assembly's forum post here! The Aecir are the sworn vanguard of Ah’wena, ever vigilant as we protect the hallowed Arcora. She alone speaks for the Seven, and therefore, the people. It is our oath to give our lives for those that live within these sacred lands and to see to it that the Arcora is always safe to seek her visions, as the descendant of the great Elyn Rizi. Through our diligence, those that aspire to live their lives with zeal, those who walk the spirit path, and those that pursue the arts and wild ways, may live in harmony with the land and stars. We stand to keep the ancient traditions alive by ensuring that the town of Ah’wena itself, its inhabitants, and all it stands for is never conquered. No matter what threat we may face, we must protect the last of the original seeds of the Oakenroot people. This culture shall never be lost. The Il'g'hanir Senteri will be our sovereign idols and will bind us together in belief. Il'g'hanir Senteri are “Those Who Stand by the World. These seven spirits represent our core standards and will bless us in day to day life. They will watch over us and guide us in times of struggle and strife or peace and prosperity. 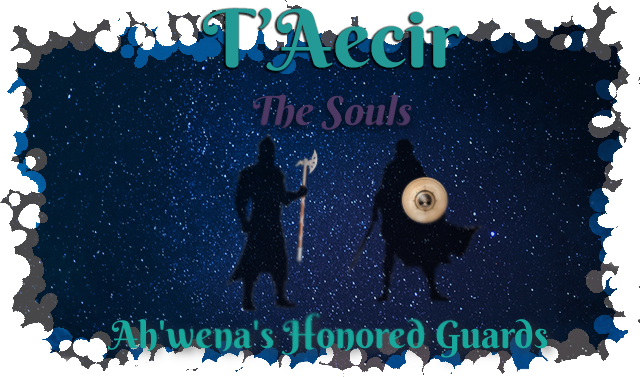 The Aecir serve as town guards and personal bodyguards to the people of Ah’wena. The Aecir submit directly to the Kal’Aecir and Tah’Aira (the mayors of T’Aejo and Ah’wena respectively). Ah'wena being an RP hub, PvP may be few and far inbetween for many of our players; as such, we must diligently train our combat prowess whether we are in times of peace or war. PvP, of course, does not provide the only need for protection. 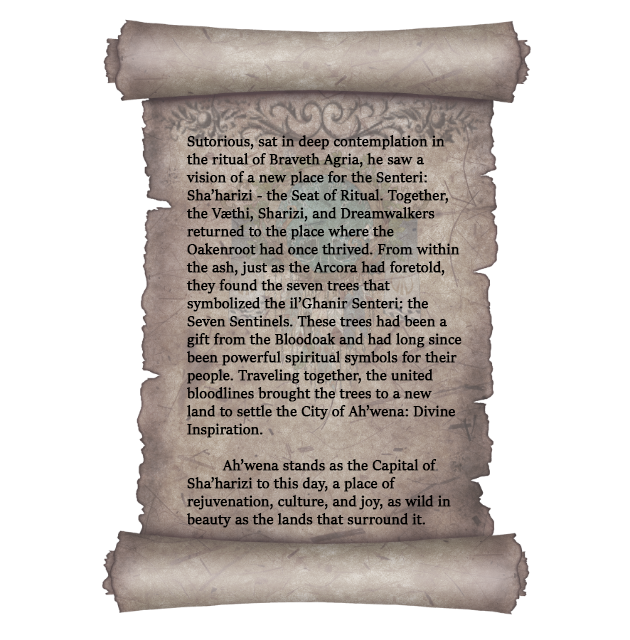 PvE elements in the world of Chronicles of Elyria may pose unexpected threats. The guard may be required to fend off beasts, NPC raiders, or help in times of disease, famine, or other natural disasters. They truly stand as the backbone of Ah’wena. For the full recruitment post, see the post. A very impressive and well written introduction of your settlement. Your focus on RP brings back memories from my time living in player run settlements during my Ultima Online days. I am pretty sure you will have a thriving RP community! Alas, a shame I shall not be able to visit as I will be playing on the EU server. The best of luck in building up Ah'wena's community! Ultima Online was some good times. I miss them! Yep! :) Glad to have you come chat with us! I was pleased to be featured on Van "Waxseal" Andersen's first Chronicles of Elyria Round Table this evening. You can check it out on Youtube. I have taken some time to meet the community behind Ah'wena. They are a great group of people. If you plan to play on the NA-E server and love to roleplay I highly recommend visiting Ah'wena's Discord channel! Wolffje - I am so sad you won't be joining us in game as you're on the EU server, but I am certainly glad to have you as a part of our community for chatting and enjoying each others company. Thank you for coming to see what Ah'wena is all about. I hope that as NA-E players come in, they'll really see what you saw!